Since 1897, when the Carlton Football Club became one of the foundation clubs of the Victorian Football League, only two sets of twins have worn the Famous Old Dark Blue. Doug and Dave Gillespie were the first, back in 1906-07. Thirty-five years later, Harold ‘Hal’ Hanton made his debut for the Blues, one year before his twin brother Alexander. The identical twins were born at Frankston on May 25, 1922. Harold preceded Alex into the world by 20 minutes. Two years later, the Hanton family relocated to inner-city West Brunswick, and in time the twins chased the leather for St David’s in the local Church football competition, and with Frankston Juniors in the Mornington Peninsula Football League. In August 1942, Alec and Harold enlisted for wartime duties in Western Australia, as signalmen for the Army’s B Australian Corps. Their service took them to Townsville, the tip of Cape York, back to Melbourne, and finally to Bougainville, before their discharge in 1946. While in uniform, the twins kept their skills up to scratch in regular inter-unit and inter-service games. 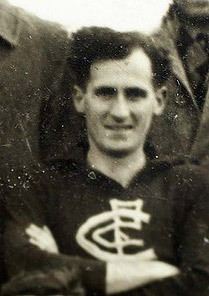 By a stroke of good fortune, Hal was invited to take part in a trial game at Princes Park in the lead-up to the 1945 season, and did enough to convince Blues’ coach Percy Bentley to include him in Carlton’s team to play Melbourne in round one. In guernsey number 5, Hal manned-up on the Demons’ resting ruckmen in a back pocket, but was unable to stop them and their cohorts often enough and Melbourne won by 21 points. He was given another chance the following week against Hawthorn at Glenferrie Ova, but a 30-point defeat brought his senior career to an abrupt halt. Years later, Alex explained why. “We were posted overseas after the fifth round,” he said, “and we weren’t very popular with Harry Bell - the secretary, because we didn’t tell Carlton early enough to stop our posting”. Although he was quite handy in his one and only senior outing, and would eventually rack up 40 Reserve grade games for the Blues, Alex was always the first to admit that he wasn’t consistently good enough to further his career in the seniors at Princes Park between the Premiership years of 1945 and 1947. Still, the Hantons’ love for the club never waned. For years they took their seats in the old Hawthorn Stand, and were shoulder-to-shoulder at the MCG for all eight of the Blues’ glorious Grand Final conquests between 1968 and 1995. In their twilight years, the brothers both lost their sight - but never their allegiance. As late as 2000, Harold had his photo taken with Anthony Koutoufides on a much-anticipated visit to the old Carlton ground, while Alex, to the end, tuned in to Melbourne radio to follow the fortunes of his beloved Blues every weekend. Aged 90, Harold and Alex Hanton both passed away in September, 2011 - nine days apart. Contributors to this page: PatsFitztrick , molsey , Jarusa , tmd1 , WillowBlue and admin . Page last modified on Thursday 20 of October, 2011 21:12:15 AEDT by PatsFitztrick.